FC Barcelona was held to a goal less draw at the San Siro stadium by AC Milan in the first leg of Champions League Quarter Final. A brilliant defensive display from Milan, coupled with a horrible pitch was good enough to negate any Barca threat. Arsene Wenger did complain about the state of this pitch, but I never throught it was this bad. The absence of an away goal complicate the return leg at Camp Nou, but still the fact that we got out of this pitch without any major injury was a good result. There was one surprise in the line-up selected by Guardiola, that was Keita being preferred ahead of Cesc Fabregas. 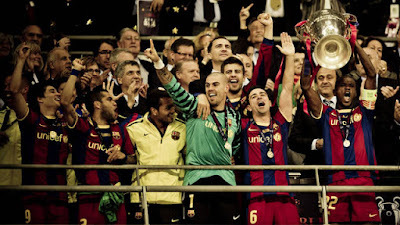 We had the defensive line-up of Alves, Pique, Mascherano and Puyol infront of Victor Valdes. BUsquets, Keita and Xavi made up the midfield. Messi, Iniesta and Sanchez formed the front trio. AC Milan lined up with Abbiati, Bonera, Mexes, Nesta, Antonini, Ambrosini, Nocerino, Seedorf, Boateng, Ibrahimovic and Robinho. FC Barcelona has landed in Milan to face the holding Serie A Champiosn in the first leg of Quarter Finals of this year's UEFA Champions League. Barca fans were given a good news of Ibrahim Afellay being fit and he has made it into the squad which will face Milan tomorro at the San Siro. There has been a bit of concern about the state of San Siro pitch and how it will play. We could only hope that it plays better than the Arsenal vs Milan match in the last round. AC Milan was one of the teams which every Barca fan want to avoid at this stage, but we still have the advantage of playing the second match at Camp Nou. In the pursuit of La Liga and Champions League, this week could prove to be a pivotal one for FC Barcelona. We will be facing Milan at San Siro and in the weekend we will be hosting Biesla's Athletic Bilbao. Both the games have becom pivotal for Barca and we could not afford not to win any of those. The squad selected by Gaurdiola for this match includes Valdés, Pinto, Alves, Piqué, Fàbregas, Puyol, Xavi, Iniesta, Alexis, Messi, Thiago, Mascherano, Keita, Sergio Busquets, Pedro, Afellay, I. Cuenca, Muniesa, Montoya, Oier, and Cristian Tello. Apart from Afellay's inclusion there wasn't much surprise in the list. FC Barcelona cut down the lead at the top of the table to three points with a very hard working 2-0 victory against Real Mallorca. A brilliant free kick Messi and another goal from Pique was enough to see off the Mallorca challenge. It was a very tough match - having to play on a horribly dry pitch and also to have play with ten men for the last thrity five minutes after Thiago was sent off. But those factors didn't matter as our players played with their heart out and now the pressure will be on Real Madrid to regain their six point lead. Pep Guardiola went into this big away game with a three man defense of Mascherano, Pique and Puyol. Xavi started from the bench with an eye on AC Milan clash. So we had a midfield of Iniesta, Thiago, Busquets and Cesc Fabregas. Messi, Pedro and Sanchez made the front trio. FC Barcelona cut the lead on the top of the league to five points with a rather scrappy 5-3 win. Real madrid will have a chance to extend the lead, but for the time being we are five points below them. A hat-trick from Lionel Messi and one each from Xavi and Tello gave us a a deserving victory. It was a bit scrappy in some sense - we lead 2-0 with Granada completely out of the picture, then let them come back and make teh scoreline 2-2 but we woke up enough to finish off the game. All the eyes were on Messi building into this match. A recently conducted study has revealed that Cesar, the club's official top scorer has only scored 232 goals instead of the earlier believed 235. That meant Messi needed only one more goal to equalise that tally. The starting eleven selected by Guardiola was Valdes, Alves, Pique, Puyol, Adriano, Keita, Thiago, Xavi, Sanchez, Messi and Cuenca. Barca players lined up with "Fabrice. We are with you" T-Shirt showing their support for the Bolton player Fabrice Muamba, whose condition is said to be improving at the moment. Granada players lined up with a message showing their support for Eric Abidal, our King. FC Barcelona notched up five consecutive victory in the league for the first time in the 2011-12 season with a 2-0 victory at Sevilla. First half goals from Xavi Hernandez and Lionel Messi, which may go down as one of the contender of "Goal of the Season" were enough to see a tricky fixture with against a side we always struggle. With this victory we have cut down the lead at teh top back to seven points temporarily. BUt Real Madrid has the chance to restore the lead to ten points when they meat Malaga tomorrow night. Guardiola went with Alves, Pique, Mascherano and Adriano in defense. 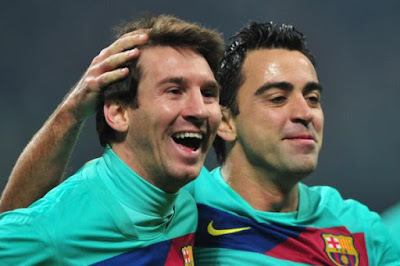 Xavi, Busquets and Fabregas made up the midfield trio. Pedro, Messi and Iniesta formed the attacking trio. Both teams lined up in the start with "Animo Abidal" T-Shirts to show their support for Abidal, who will be having liver transplant soon. FC Barcelona will meet AC MIlan in the 2011-12 Champions League Quarter Final. The first leg of the tie will be held on the 28th of March at San Siro and the return leg will be held at Camp Nou on 3rd of April. It is second time Barcelona is drawn to meet the defending Serie A Champions. We have already met in the group stages this year, with we winning one match and drawing the other. For me, this is one tie I wanted to avoid as there is too much coincidence between Inter scenario a season ago. The best part of the draw is that we will play the second leg at home. But remembering that night in San Siro against inter, it now becomes paramount to play our heart out at San Siro this time around. Among the other draws, Real Madrid is the one who got one of the easiest draws. Our arch-rivals will play APOEL with the first leg taking place in Cyprus. The other Quarter Finals are Benfica vs Chelsea and Marseille vs Bayern Munich. 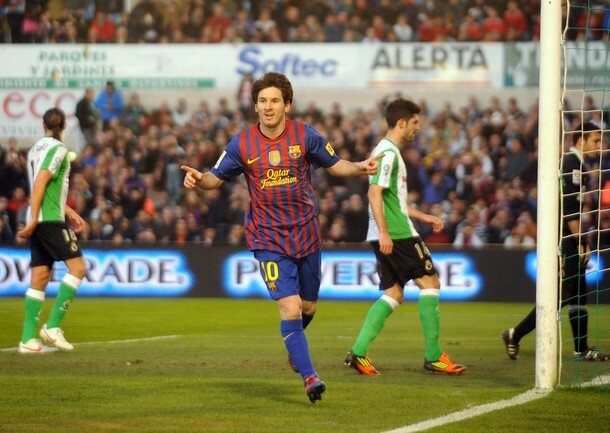 FC Bracelona made short work of a physical Racing Santander side with a comfortable 2-0 victory at the El Sardinero stadium. Two goals from Lionel Messi, the second coming from a penalty was enough to help Barca fetch all three points and reduce the lead on top to ten points. With a 72% possession statistics this game was as comfortable as it can get, barring the constant kicking and hacking down our players have to go through. Racing under their new coach did take a leaf out of Mourinho's and Pepe's playing style in trying to stop Barca. BUt that all ended in vain with we rounding off a decennt performance with a two goal victory. It also saw us winning our first penalty away from home, a rarity for us this season. Guardiola picked the best available eleven - Valdes, Alves, Mascherano, Puyol, Busquets, Fabregas, Iniesta, Xavi, Cuenca, Pedro and Messi. The formation of choice was a 3-4-3 one. 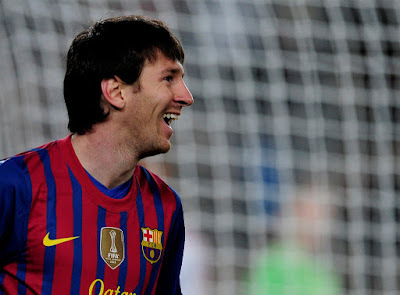 Lionel Messi scored five in the thrashing of Leverkusen at Camp Nou by 7-1 score line. 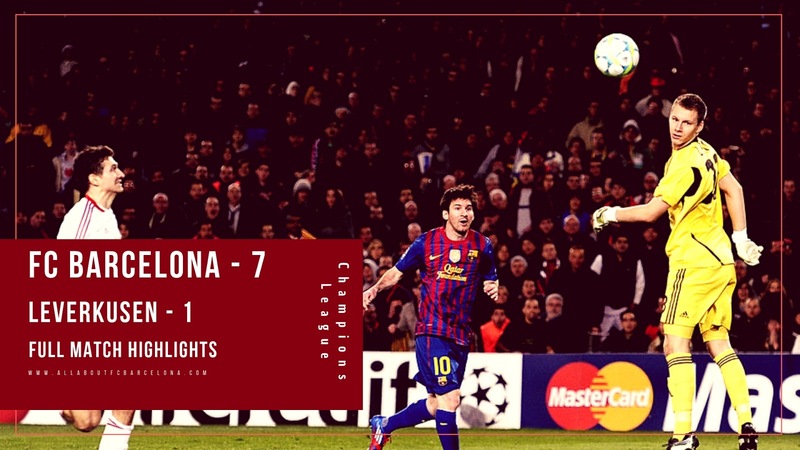 FC Barcelona simply blew off Leverkusen at a brilliant night at the Camp Nou. The 7-1 victory has to be a stern message to all our challengers in Europe this season. With a 3-1 away lead we were almost there in the quarter final. But following last night's Arsenal's comeback against Milan, there were some nerves. But the team simply blasted those. In the end we won 10-2 on aggregate. It was a record breaking night. Lionel Messi who was rested in the weekend cam roaring scoring five in the night. Tello who made his debut scored twice to complete the 7-1 scoreline. This is Barca's biggest victory in UEFA Champions League. 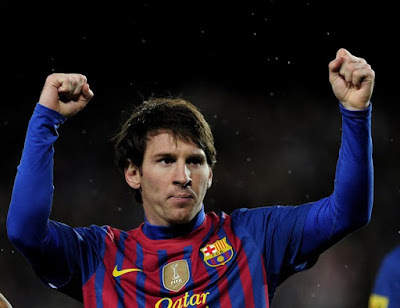 Messi became the first player to score five goals in a single Champions League match. He right now has 12 goals from 7 matches in this Champions League, equalling his last season tally. Puyol and Abidal were ruled out for the match. So we had Adriano, Mascherano, Pique and Alves in defense. Busquets, Iniesta and Xavi made the midfield. The front trio were Pedro, Messi and Fabregas. Leverkusen was coming into teh match on the back of a splendid victory against Bayern Munich. So it promised to be an interesting battle. FC Barcelona managed to reduce the lead on top of the table to seven points with a brilliant 3-1 victory against Sporting Gijon. For a Barca fan it was a memorable victory as we had to play the entire second half with ten man following Pique's expilsion. Iniesta gave us the lead in the first half, Gijon equalised after Pique's send off but Keita restored the lead with a magical goal and Xavi completed the scoreline. With Busquets and Messi suspended and Abidal injured, Guardiola had to re-shuffle a bit. The defense had Adriano, Mascherano, Pique and Alves. 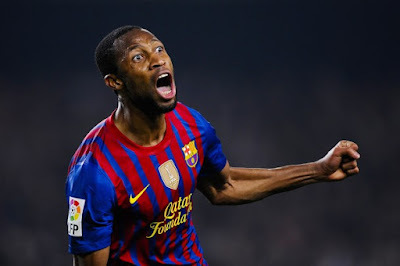 Keita played the holding midfielder role flanked by Iniesta and Xavi on either side. The front trio were Cuenca, Fabregas and Pedro.